* Colin Kaepernick has attempted 150 passes so far in 2014. When passes that were thrown away (11) or dropped (9) are removed he has a completion rate of 75%. He has at least 1 touchdown pass in 15 straight games, including playoffs. 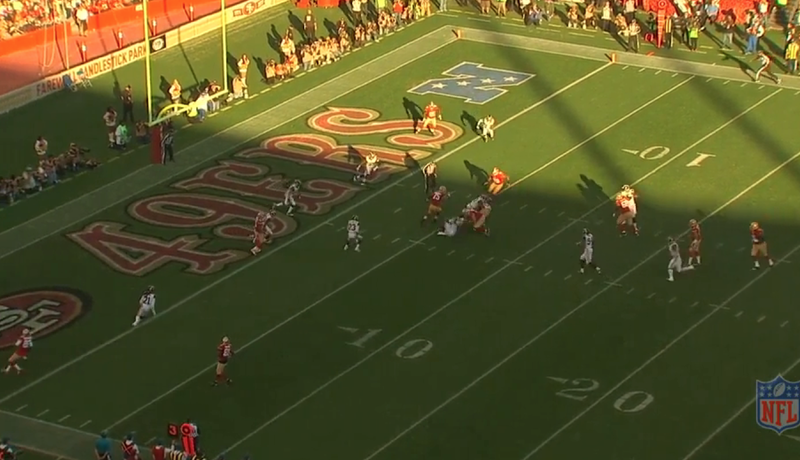 * Brandon Lloyd leads all 49ers wide receivers in deep targets, throws over 20 yards. Of his 14 targets this season 7 have been over 20 yards. * Frank Gore has given up only 1 quarterback pressure on 34 pass blocking snaps. This ranks him behind only Ahmad Bradshaw and Jacquizz Rodgers. Rookie Carlos Hyde has given up 2 pressures on 24 pass blocking snaps. * 49ers offensive line has given up the 8th most pressures in the NFL and is ranked 27th in pass blocking efficiency. On the positive side they are ranked 2nd in running blocking. * Ray McDonald is ranked 3rd among 3-4 defensive ends against the run. He has been responsible for the run stop on 12.5% of defensive run snaps. * Rookie Aaron Lynch is ranked 12th in pass rush productivity among outside linebackers who have played at least 25% of their teams defensive snaps. * Patrick Willis and Michael Wilhoite are tied for 23rd among inside linebackers with a run stop percentage of 8.6. * Perrish Cox has allowed a 28.6 QB rating. Only Vontae Davis in Indianapolis has been better. * Antoine Bethea has the second best overall grade among safeties at +8.6. A big reason for the 49ers success over the last three years has been the result of the their depth. The 49ers has had one of the deepest rosters in the NFL. Once they commit that type of money to Kaepernick they will be forced to cut in other areas. This will force the team to rely on younger, less expensive and experienced players and force Kaepernick to shoulder a larger role in the teams performance. Throughout the season there have been a number of complaints regarding the 49ers offense, one being the lack of their use of screens. 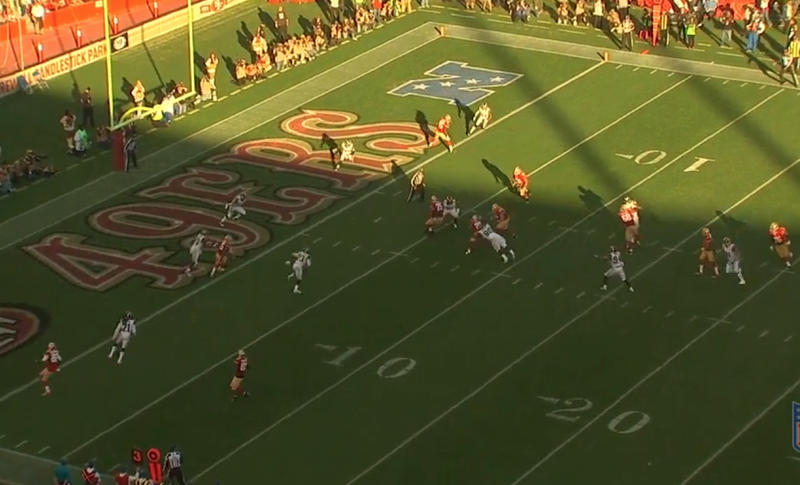 The 49ers actually run a fair number of these, but often it is not done in the conventional manner of a pass to the halfback. This week ProFootballFocus reported that the 49ers have thrown the second fewest screen passes to their halfbacks in the league, ahead of only the Arizona Cardinals. This has of course led to speculation as to why this is the case. Many, myself included have stated that the reason is due the personnel. 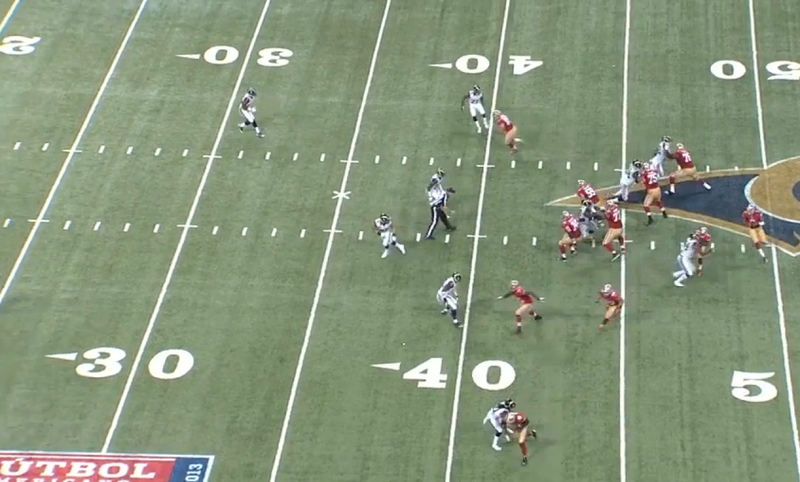 As a power run team the interior linemen on the 49ers are not at their best when asked to block in space. I have gone through and found the 5 screen passes referenced by PFF and will detail them below. The one thing that I found is that they have actually tried to run 2 outside screens to the halfback, the other 3 are all inside screens off the same backfield action. Let's take a look. This is your typical outside screen in which the guards will pull upfield to pick up the inside linebacker that started out over them. In the picture below you can see Alex Boone already locating the linebacker and beginning on his track. 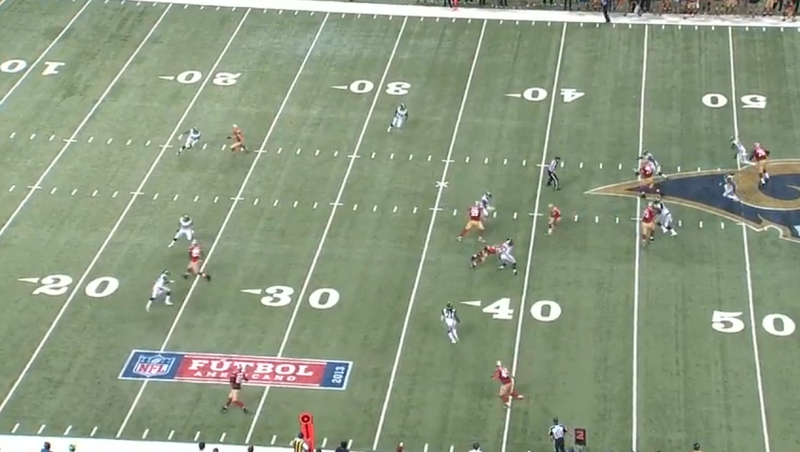 Anthony Davis has done a good job of keeping the end off of Dixon who is faking pass protection. 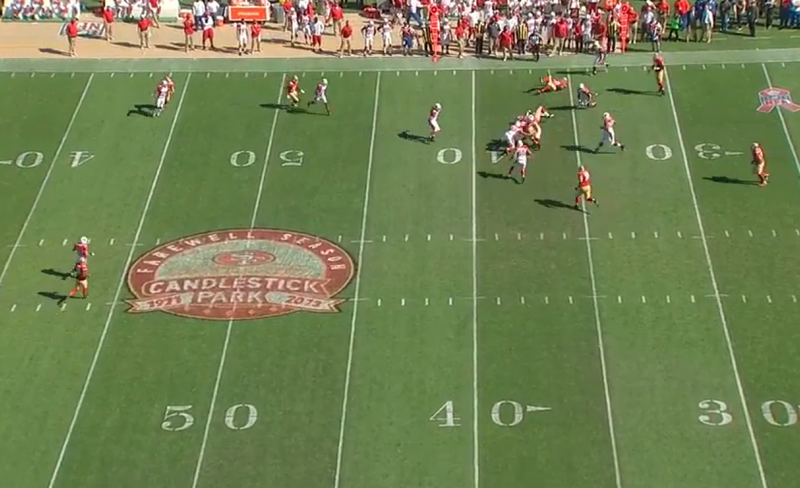 Dixon has now peeled outside while Boone and Iupati close in on the linebackers. Dixon has the ball and has started upfield. 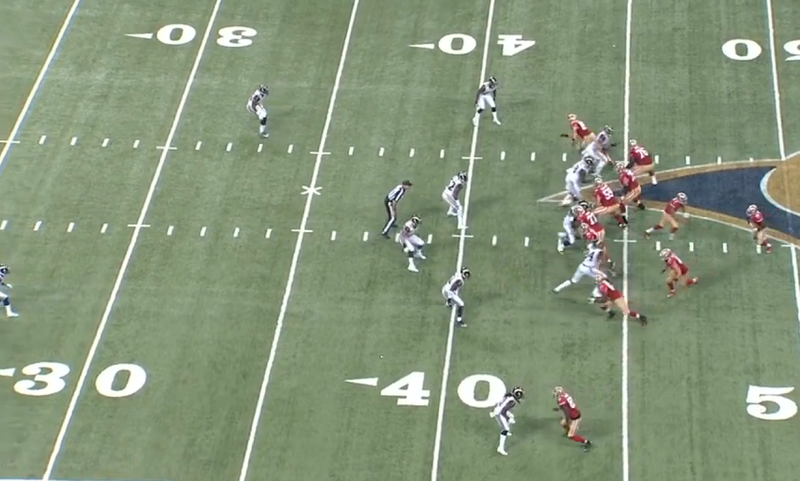 Boone is to kick out the linebacker (push him to the sidelines) while Iupati cuts his man off. 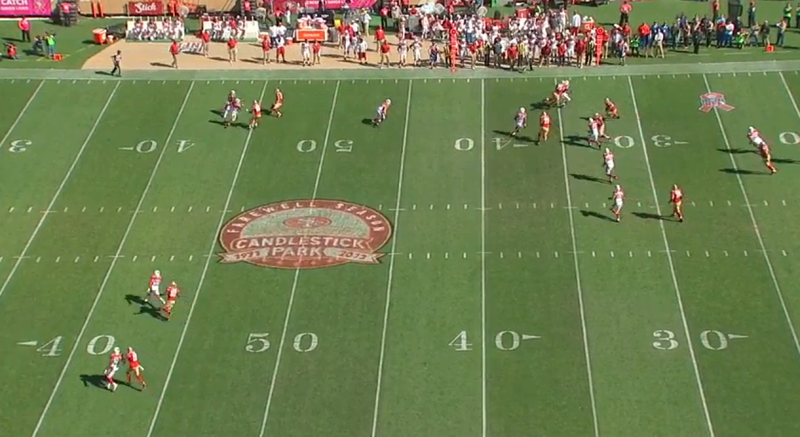 Dixon doesn't hit the small seam created by the linemen, instead cutting back inside of Iupati and into the pursuit of the Cardinals defense. 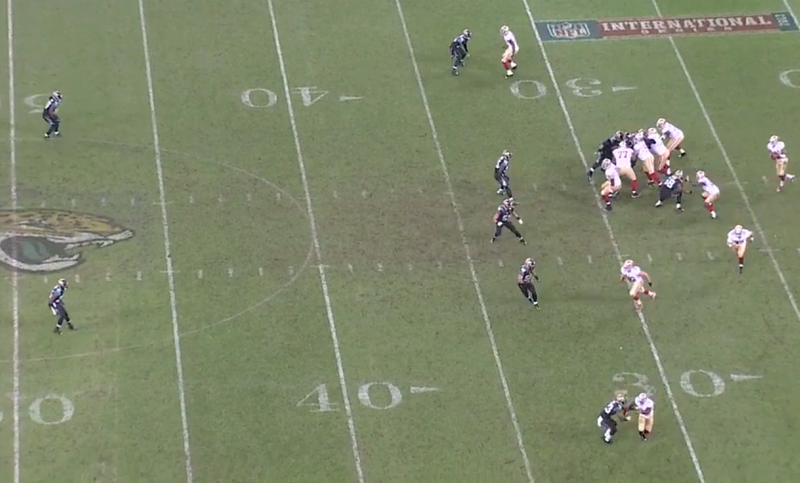 VS Washington, 11 personnel 2nd & 5, SF49, result Kaepernick is sacked for a loss of 4. Three things have already happened to kill this play. 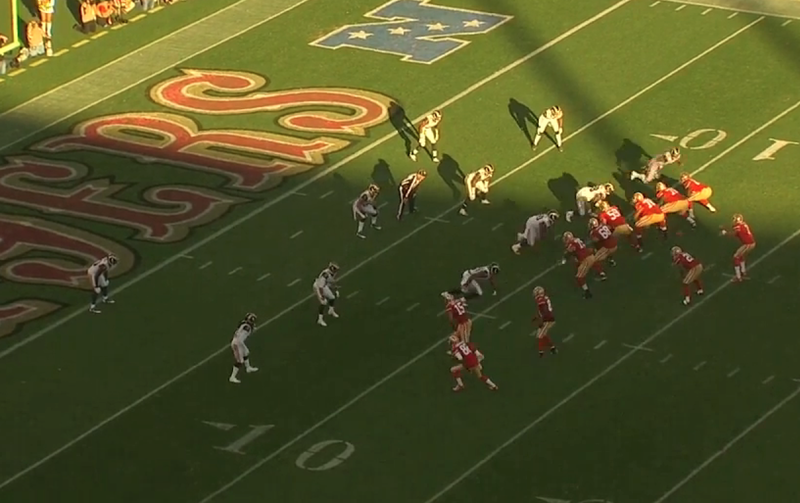 The first is that the DE over Joe Staley has crashed down, taking Iupati out of the play and second the OLB has recognized that it is a screen and has grabbed Gore in the backfield. The play side inside linebacker has also quickly recognized the screen and has gotten outside to a point in which the lineman can not make it out to him. As a result of the outside linebacker blowing up the play Kaepernick is left with no other option than to try and run the screen himself. He rolls to his left and slips down while trying to make a cut. You should notice that the backfield action and down field blocking by the line are the same on the next 3 plays. It starts with a play action look to the left. Staley leads the DE up the field and quickly releases to get to the second level. Hunter chips on the DE. This is key to make it look like a pass that they have already successfully run to Miller in the flat. Notice Miller running the route. Staley and Goodwin have already released their blocks and are location. You can see that he has already begun to turn and run. Ball is delivered to Hunter. Goodwin top and Staley bottom begin to get into their blocks. Unfortunately Staley has over pursued his man and is in poor position to make the block forcing Hunter to stop his feet and cut. You can see that Staley is almost parallel to the ground. 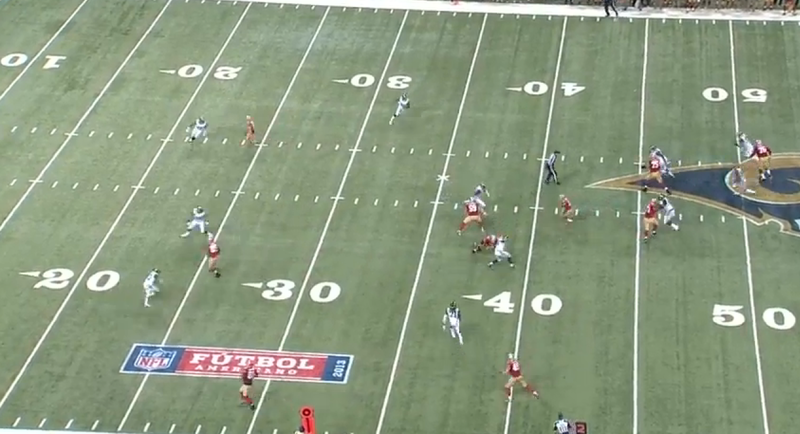 After cutting Hunter is able to pick up a few more yards for a gain of 9. VS Jacksonville, 22 personnel 2nd & 24 SF 29, result 6 yard gain by Gore. Same exact play as above. 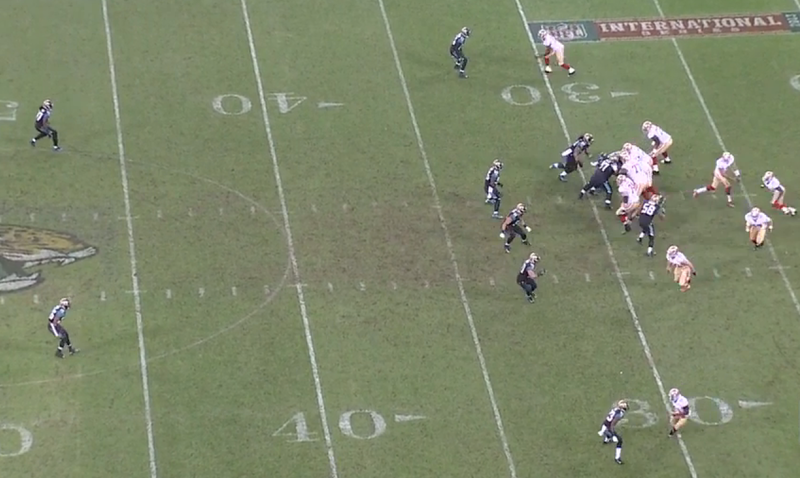 Goodwin gets caught up inside, leaving only Staley to block the 2 inside linebackers. As a result the unblocked linebacker is able to make the tackle after a gain of 6. 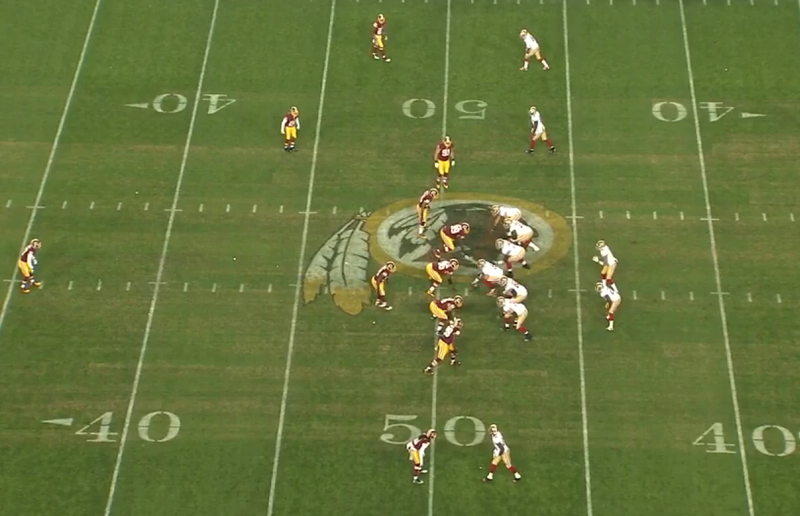 VS St Louis, 11 personnel, 3rd & 9 StL 10, result 3 yard gain by Gore. Same play as the two above, but from a different look. 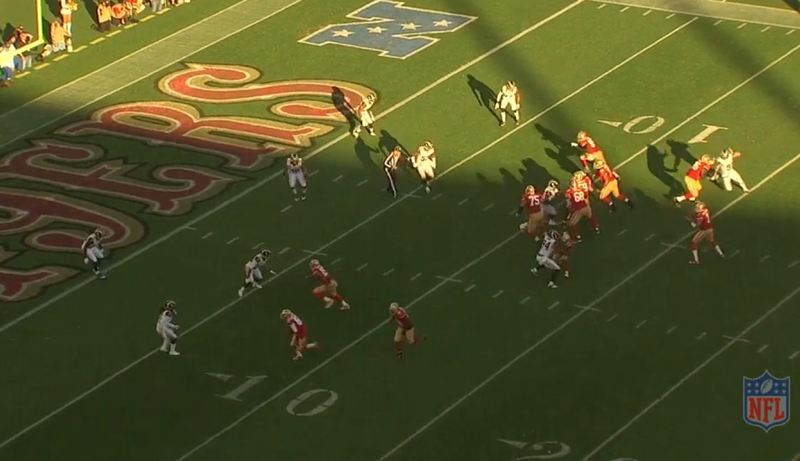 Boldin runs the flat instead of Miller and Kaepernick tries to draw attention in that direction with a quick pump. 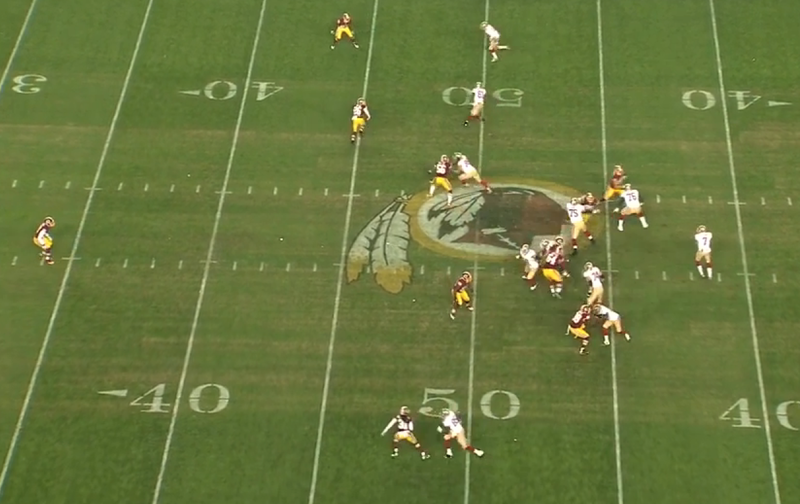 Gore is chipping the DE and Boone is heading up field for the inside linebacker. 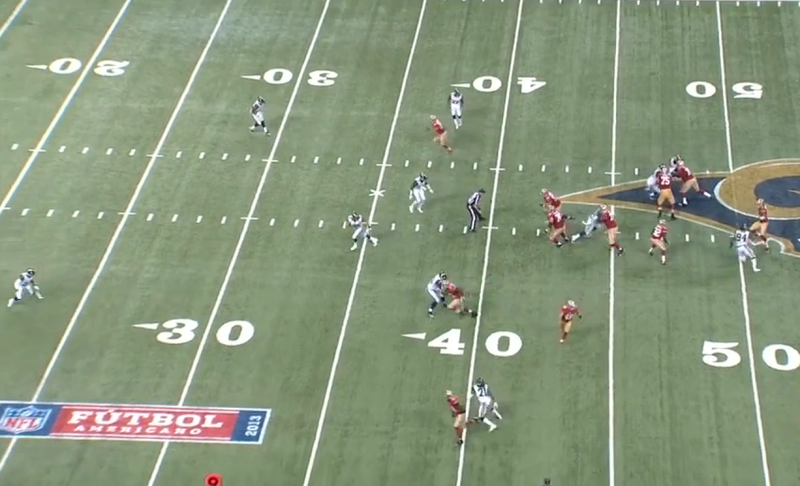 The play is blown up by the DT on the right side of the Rams defense. He does a nice job of recognizing the screen and dropping off. 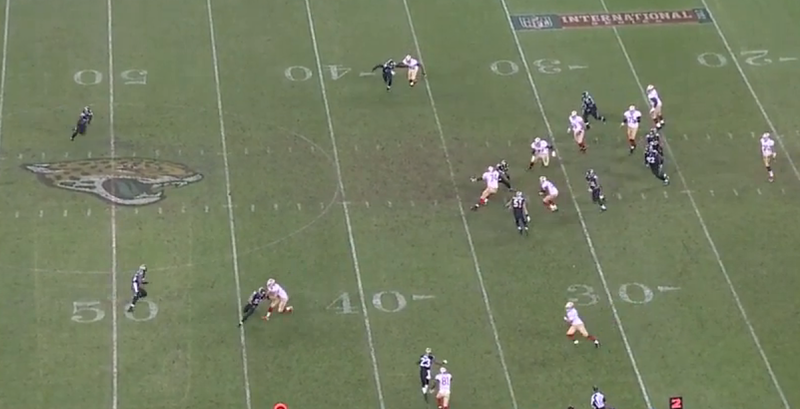 As a result he is on top of Gore and brings him down for only a gain of 3. 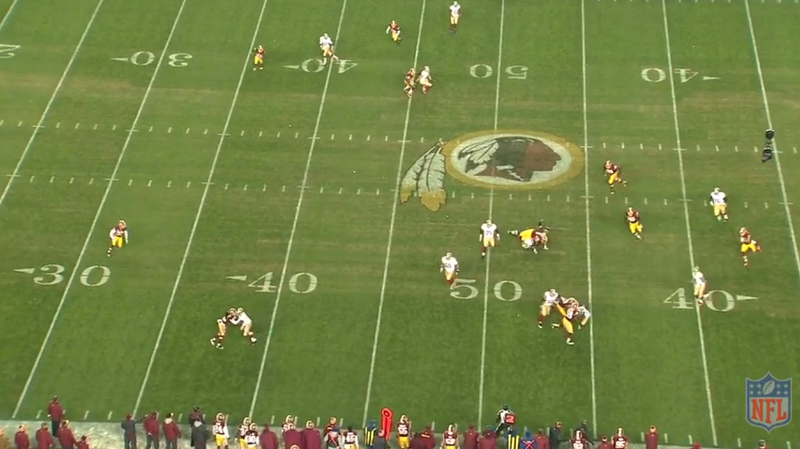 You can see the path to the endzone had he not properly diagnosed the play. Roman on Seattle D, "the beauty of what they do is it’s pretty simple and it’s pretty consistent." This got me thinking, "how simple and consistent are they" so I went back and looked at the film of the game from week 2, and what I found was that Roman's words were very true. 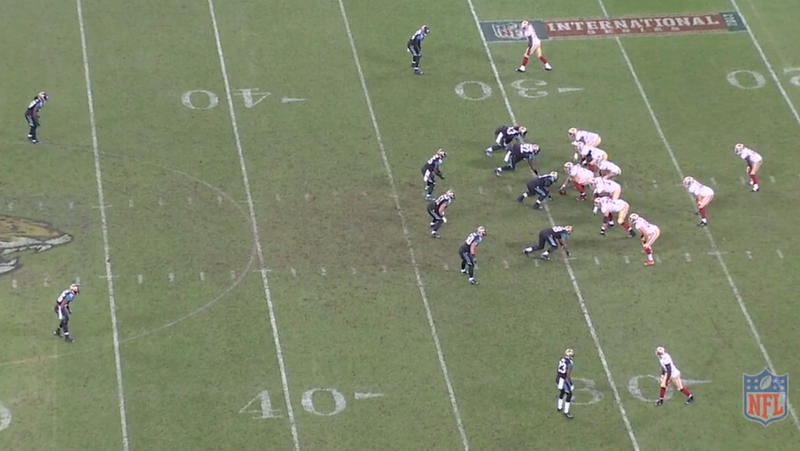 On base downs such as 1st and 10 the Seahawks lined up with the same front every time (shown below). The linebackers would shift around slightly depending on the 49ers formation, but those movements were minor for the most part. 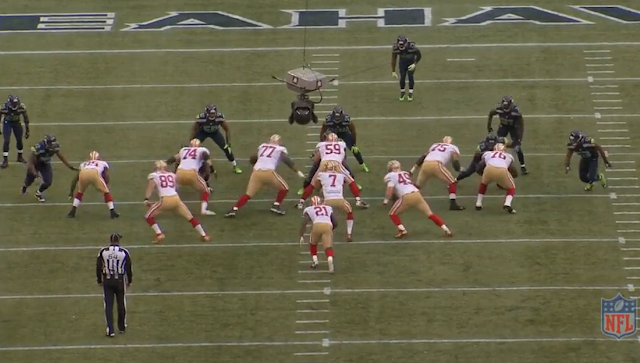 The only time the Seahawks would adjust out of the above front was when the 49ers would go into their diamond formation. As shown below, when this would happen Seattle would adjust their front to a 3-5-3 look by sliding the man to head up on the center and the safety stepping inside over the tackle. The picture below is an example of this. The 49ers motioned into the set and the Seahawks are adjusting into it which is why the picture is just after the ball has been snapped. If they are so simple why have are they so good? The answer to that is also simple. 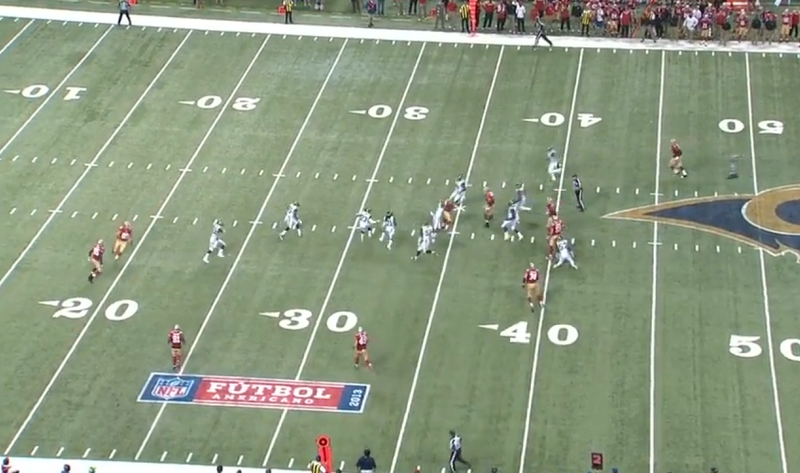 By limiting the number of things they need to do the Seahawks defense can play extremely fast. This also partially explains why they are able to fit different guys into their scheme seamlessly. Being so basic allows the coaches to maximize practice reps and drills to get them prepared week in and week out. And don't forget those guys are pretty good over there. Can the 49ers take advantage of this simplicity after two straight losses up in Seattle? They've been closer than the scores would make it seem. Vic Fangio's press conference transcription from Dec 5th courtesy of the 49ers. Greg Roman Press Conference Dec 5th. Greg Roman's press conference transcription courtesy of the 49ers. Going back and seeing how WR Michael Crabtree performed on his way back, did you think he was all the way back even before you saw that 60-yard catch? He didn’t have any adverse reaction to playing that many snaps and then playing alright in practice? I know every game is, the saying before every team is another opponent. But knowing how important Seattle has been for you guys in the division and how good they are, during the offseason did you find yourself drawing up some things just because of Seattle or think of a different personnel lineup because of Seattle does? Any extra? They’ve had a couple that’s been tight at halftime a couple times and they’ve extended it big time in the second half. Was that adjustments they were making? Was that schematic in any way? Do you like the emotions your wideouts are showing out there, especially WR Anquan Boldin, who was pretty hyped up last Sunday throwing his arms up? Does some of that chemistry come from having that group all healthy again? Has G Joe Looney been working as a right guard this week with pads? Who else has been rotated in? Do you get him on the left side too, though? Do you get him on the left side too? If neither T Joe Staley or G Mike Iupati can go, who do you bump up to the active 46? I have a question about QB Colin Kaepernick. Whether it’s through play calling or what you instruct him during the week, do you guys limit how many times he runs with the football in regular season games? Do you keep track of a number? It seems like you track a hit chart, how many times a guy gets hit? Do you guys do that? 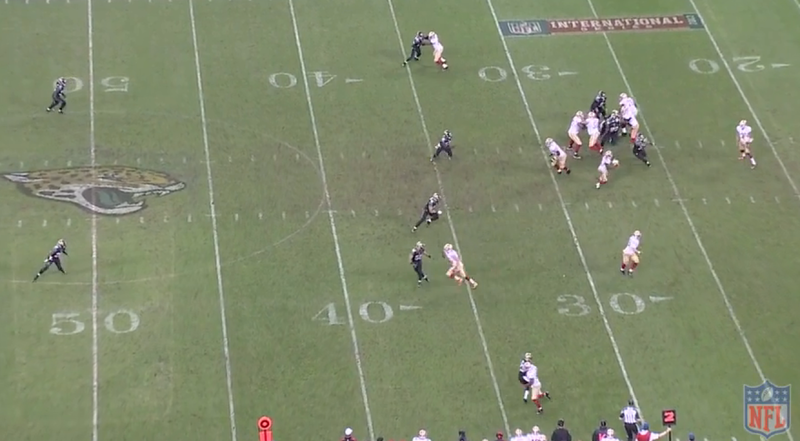 On the play Crabtree broke for the long play, did you put that in especially for him coming back? Was that installed last week just for that? Going back to Kaepernick, how do you feel about how he’s done, how he’s managed getting the yards when he can and then getting down and avoiding the hits? How much would you say the improvement recently in passing has to do with the health of the receivers versus it seems like defenses are trying to stop the run? How do you think that these young offensive linemen, or maybe the more inexperienced offensive linemen, would be equipped to handle a game like this? DE Michael Bennett of the Seahawks said he wants to come down here and bloody your guys’ noses and things like that. In a game with the physical magnitude that this will have, how do you think they’re equipped to deal with that? You guys have faced DE Cliff Avril a couple years in a row. Does Seattle use him any differently and I know he’s always lined up on that left side across from T Anthony Davis, and what do you think about that matchup, Avril on passing downs against Anthony? Does any NFC team come to mind that [inaudible] the way they can rotate those defensive linemen, that has that kind of defensive line depth? Real quality guys coming off the bench. Why has Seattle been a tough matchup for Colin in his two starts? Is there anything they’re particularly good at? We’ve asked the players, asked defensive coordinator Vic Fangio, he said Seattle’s just another game, but how important is it, do you think to the coaching staff, to not be swept by Seattle, show that you can beat Seattle this weekend? Is that something that this offense has won in different ways, and if you take Houston out of the equation, has had a difficult time with really good defenses, like top ranked defenses, is that something that this offense needs to put together a good game. Obviously, against Seattle, like you said, execute just for the benefit when you close out the season going into the postseason? When you’ve beaten the Seahawks, generally what have you done well offensively? What’s been there for WR Quinton Patton now that he looks healthy? Quinton Patton, now that he looks healthy, do you guys have a plan for him? The 49ers dominated the Rams on Sunday to pick up a 23-13 win. The 10 point margin of victory does not show just how convincing the win was. The 49ers defense held the Rams to 108 total yards of offense through the first 3 quarters while building a 23-6 lead. 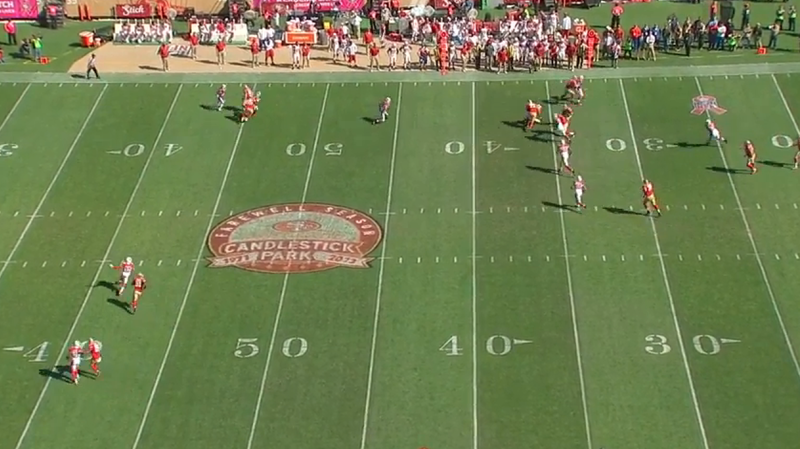 On the flip side the 49ers did not go 3 and out until their first possession of the second half. The did this despite losing Pro Bowl left tackle Joe Staley on the 6th play of the game and having to reshuffle their line. 1) What impact will Michael Crabtree have? - 2 catches for 68 yards. Played 42 of 67 snaps (63%). After a rough start in which he was called for a blocking in the back and pass interference, Crabtree settled down and played a good game considering it was his first live action since the Super Bowl in February. 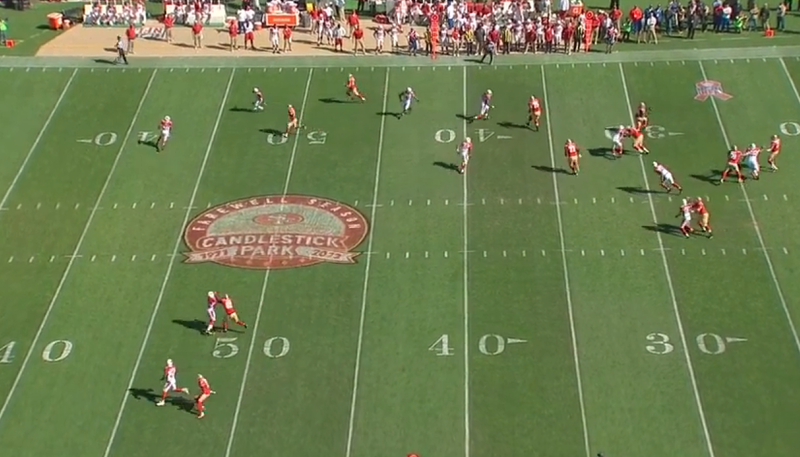 His 60 yard reception in the 3rd quarter was vintage Crabtree, a quick stop and go that could have gone for 6 if not for the safety taking a good angle and cutting him off around the 10 yard line. 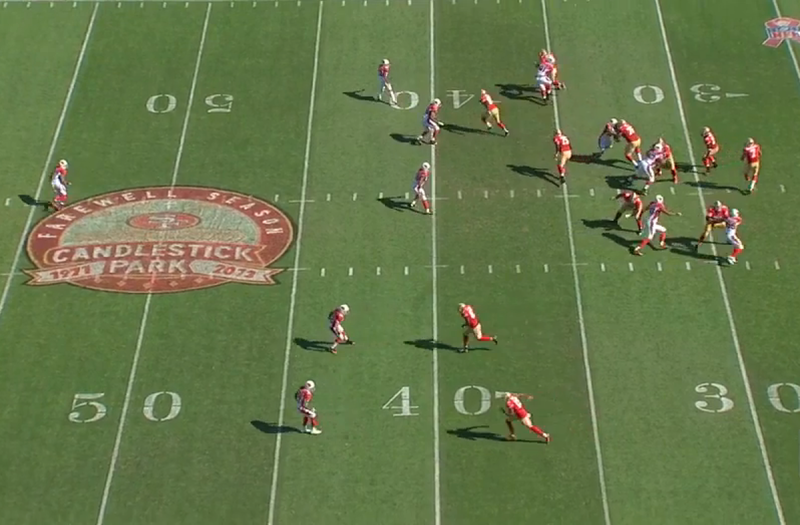 2) Can the 49ers get the run game going? - No. 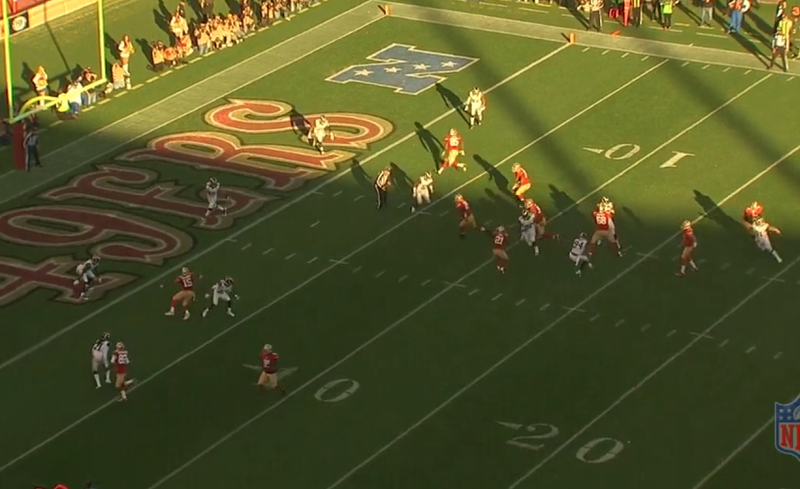 The 49ers could only muster 83 yards on 30 rushes (2.8 ypc), and those numbers are helped out by 2 Colin Kaepernick scrambles. The key though is that the 49ers coaches continued to try to get it going, which kept the play calling balanced leading to 69 passing yards and their only passing touchdown off play action from their 22 personnel package. 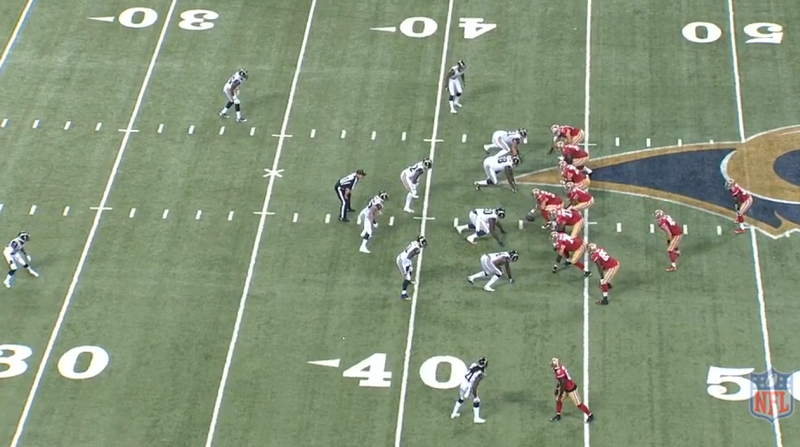 3) Can the 49ers defense contain Zac Stacy and Tavon Austin? - Yes. The 49ers run defense held Stacy to 3.8 yards per carry (19 - 72yds) which is over half a yard less than he was averaging coming in. Austin was a non-factor in the passing game with 4 receptions for only 25 yards. He was slowed down in the return game as well as he averaged only 16.8 yards per kick off return and 1 punt return for 10 yards. 4) Can the 49ers offense repeat? - Yes. The 49ers offense put up 23 points and 338 total yards. These numbers are similar to what they did the week before against Washington, however doing that against the Rams is a much bigger accomplishment. 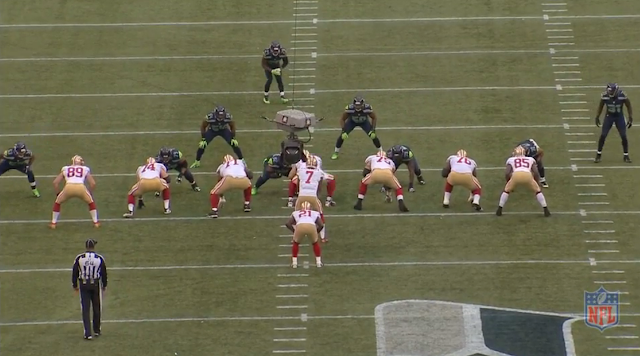 5) Can the offensive line hold up in pass protection? - Split Decision. The 49ers offensive line lost Joe Staley on the 6th play of the game forcing Alex Boone to move over to his natural left tackle position and Joe Looney to step in at right guard. 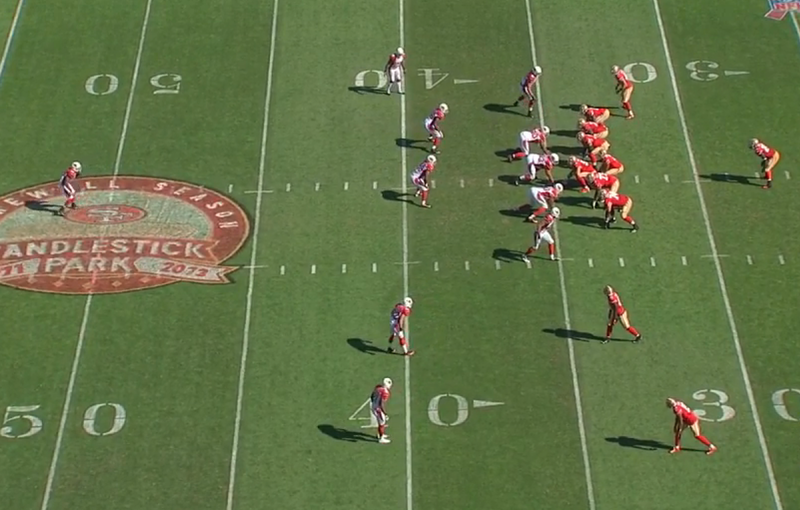 This resulted in the line giving up 4 sacks during the 49ers first 3 possessions of the game, however they gave up none over the next 9 possessions. Robert Quinn and Chris Long came into the game as two of the top 10 pass rushers in the NFL and were held to no sacks yesterday by Boone and Anthony Davis. 49ers 23 Rams 17, missed by 4 points. A nice win, now it's time for Seahawk week.